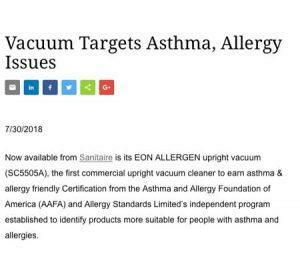 The EON ALLERGEN upright vacuum passed our strict scientific standards assessing its ability to reduce exposure to asthma and allergy triggers. It was indeed rigorously evaluated for its capability to remove allergen-containing dust, integrity of its air filtration system, airborne allergen levels during use, performance and exposure to allergens when changing the bag. “Allergens are a serious health concern, especially in schools and health care facilities, so we’re proud to arm commercial cleaning professionals with the first certified commercial floor care product to be recognized by AAFA,” said David Parkes, Sanitaire general manager of commercial floor care.